anybody have some ideas for mods (both appearance and performance) for this model car. Just bought it, and would like it to stand out a bit, and perform a wee bit better. Not sure how much "performance" stuff is out there for the 2015's? I moved your question to this area, maybe you will get more answers over in this thread..
Good Luck and Thank You for joining the HAF..
By the way, check with some of our venders sites which are on these pages that you are on..they may already have some goodies in the works for your model..
thanks folks, i'll go to that other area. and look at the ads. any more suggestions will be welcomed! I just got a V6-EXL Coupe 6 spd. All I added was the bottom trim (aero kit) to make it look sporty. Not a fan of the wing on the back. Any aftermarket stuff is going to make a negligible difference imo. maybe lower it a bit if you dont have underbody trim, but otherwise its got appropriate power/suspension for the size. I had a silver 13 and now got a white 15. Wish I got the same color, but I LOVE the two tone leather. Everytime I hand wash it I hate the color. Even in the city you see the dust onthe trunk lid, and when you close it the fingerprints really stand out. White is hard to keep clean. The alibaster silver never looked dirty, again city only for mine. Thanks for the tip.I like the two tone interior as well. It brightens things up. My neighbors own 3 white cars and seem to be able to keep them clean. My Dad had a 97 Olds and it always looked like flat white. My sister had a white 76 Mustang II and it always looked dirty. I had a silver 73 Capri and loved the color. 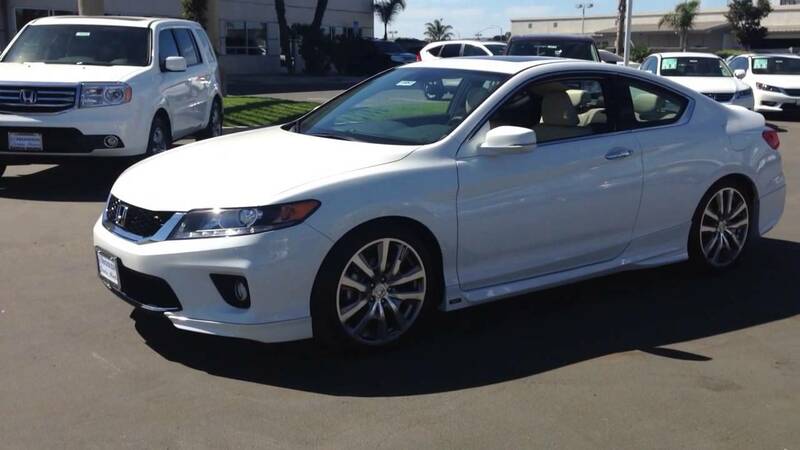 As far a 2015 Accord Coupe go, I've seen conflicting color charts .. some offer silver and a brown(tiger eye?) and some don't. I thought Honda streamlined their color charts for 2015 and eliminated these colors. ,, But then maybe just for the V6. Anyone know for sure? The '13, '14 & '15 are all 9th generation. I'm curious about the Accord pictured above as it does not have the lane-departure camera on the lower corner of the outside mirror... I was under the impression that lane-departure was standard on the EX-L.
About the color, I love my white pearl. I too live in a metro/residential area. I traded a '11 Accord that was dark blue and it showed the dirt and dust horribly. This white vehicle retains a clean look much longer. I've found though that it needs to be washed by hand as the auto-washes I've tried leave a slight haze which causes it to need to be washed more often. Something else I've noticed about the white... birds don't 'target practice' anywhere near as much with it as they do with a dark color. I have a friend who lives just one block over.. he just purchased a '15 black Civic... the neighborhood birds are having a field day on his car.